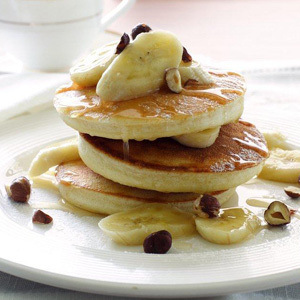 These Gluten-Free Banana-Sour Cream Hotcakes feature Elizabeth’s special Pecan-Agave Butter, made with Nature’s Agave AMBER Nectar. Try our new Raw Maple Agave Syrup as a sweet and delicious maple topping. In a large bowl place baking mix and cinnamon. In a medium bowl combine bananas, egg yolk (or egg sub) sour cream (or substitute) milk (or substitute)vanilla and vegetable or coconut oil. Make a well in dry ingredients and add banana mixture stirring until dry ingredients are just moistened. In a small bowl whip egg white until soft peaks form and fold into batter. (Skip this step if using egg replacer). Prepare pancakes on griddle or pan. Serve with a scoop of Pecan-Agave butter. Mix together with pecans, brown sugar and agave nectar and cinnamon using a fork. Serve one scoop on top of hot pancakes.